Home » DLSAA Chapters » Grade and high school manila » The DLSAA Grade and High School Manila Chapter Inc. 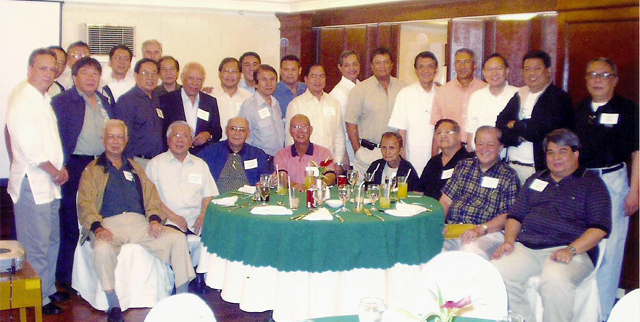 The De La Salle Alumni Association Grade and High School Manila Chapter Inc. members are a select group of alumni who take pride in being called the original “ La Sallites” who grew up within the old walls of De La Salle College in Taft Avenue. Members of the Chapter are alumni who have spent eight to seventeen years of their education in La Salle. The last high school class in Taft graduated in 1968, while the last grade school class graduated in 1984. The Chapter held its organizational meeting in October 2005 with about 30 class representatives in attendance. In a subsequent general assembly, it was decided that because of the “semi-senior” and “senior” membership of the group, its activities would be confined to fellowships. Thus, through the years, it has sponsored a number of fellowship lunches and dinners and dinner- dance concerts. Realizing that the Chapter should carry-on the La Salle “traditions” and “history”, a grand alumni-led celebration on the occasion of La Salle’s Centennial was undertaken. “Proudly Green: The Musical” was thus born. The musical “kicked-off” the celebration of La Salle’s Centennial at the SMX Convention Center at the Mall of Asia. It told the story in three acts of La Salle in the Philippines as narrated by “nine angels” representing the La Salle Christian brothers who established the Order’s presence in the Philippines. The event will go down in history as the biggest alumni gathering ever, with the attendance of over 3,000 members of the Lasallian family. 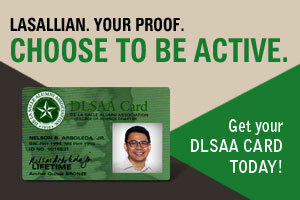 Due to insistent student and alumni demand a return engagement was held at the St. Benilde Gym in La Salle Greenhills. In conjunction with the musical production, a Centennial Commemorative Book entitled: “Archers Stories” was also published, which is a collection of stories of what student life was like in De La Salle as told by those who crossed its portals through its 100 years of existence. A traditional Latin Mass and breakfast preceded the book launching. In support of the event, well known personal and corporate sponsors of “The Musical” donated to the University bas reliefs of the Founding Brothers and Christian Brother mentors which have been installed at the St. La Salle Hall. In October 2016, the Chapter hosted “Proudly Green: A Night of Tribute” in partnership with the DLSAA in celebration of its Centennial at the Manila Polo Club. The event honored the DLSAA Past Presidents, Distinguished La Sallian, Lasallian Achievement and Sports Hall of Fame awardees, many of whom graduated from the Taft grade and high school. Last October 2017, the Chapter in response to requests for a “fun” fellowship, hosted “Proudly Green: An Evening of Music and Dancing “ at the Manila Polo Club. The affair was well- attended and even went on overtime. The Chapter is unique insofar as the membership diminishes in time rather than increases. Someday, the Chapter will cease to exist when the last La Sallite from GS’84 passes away. In the meantime, it remains challenged to continue to be the vanguards of its Alma Mater as “keepers of the flame”.